Brennan Leach '19 Spends Fall Semester as Senatorial Page in D.C.
A Shipley education challenges students to discover their passions and their potential, and to take their education to the next level. 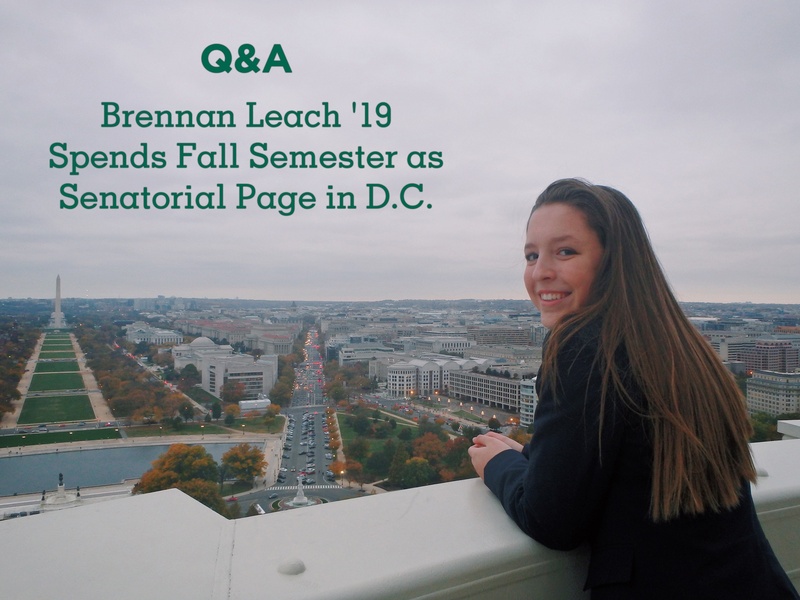 During the fall semester, Brennan Leach '19 exemplified The Shipley Method's Confidence to Explore and Deeply-Rooted Learning as she moved to Washington, D.C. to be a Senatorial Page and foster her passion for politics. Written by Zoe Quayle '19 with Brennan Leach '19. Article originally appeared in the February 2018 issue of Shipley's student newspaper, The Beacon. Brennan Leach ’19 has been at Shipley since 4th grade and has recently returned from a semester spent in Washington, D.C., serving as a United States Senate page. She applied for the program because she has always been involved in politics and was eager to get some first-hand experience working in the Capitol and among the nation’s top political leaders. When Brennan arrived in in D.C. in September, she was tasked with new challenges such as living with kids from all over the country, waking up at 5 am, and working a full-time job! Through these growing experiences, Brennan witnessed historic legislation, survived a government shutdown, met some of her all-time heroes, and learned to live independently in a new city. Where were you for the first semester and what were you doing? For the first semester of this school year I was living in Washington, D.C. and working as a United States Senate page. Pages are sponsored by a Senator from their state, and work for the party that their sponsor is from. I was sponsored by Senator Bob Casey, so I served all of the Democratic Senators. Twenty-six other juniors in high school and I sat on the floor of the Senate, helping to set up the chamber for the daily session, run documents to different rooms in the Capitol, and get Senators what they needed to deliver a speech or cast a vote. A normal workday began around 10 a.m. and would end whenever the Senate adjourned (ended session) for the night (usually about 7 or 8 pm). Where did you live? Who did you live with? All of the pages are housed in a small dorm right near the Capitol. I lived with 26 other kids, as well as five adult proctors. I also had roommates - girls from Georgia, Wyoming, Alabama, Vermont, and North Carolina. This meant that I was surrounded by people with completely different backgrounds and beliefs. By talking and debating with them, I often found that my mind had been opened to new ideas and points of view. Other times, I felt that my beliefs had been strengthened and reaffirmed. Either way, I was learning how to communicate and coexist with people I probably would have never talked to outside of the program. I learned that by looking past political views, I was able to form some of the best friendships I had ever made. At the end of the day, none of us were that different at all. We’re already planning our reunions! Yes! The page school was in the basement of our dorm. We woke up at 5 a.m., got downstairs by 5:45, and had to be in class at 6:15. School ended an hour and a half before the Senate convened (began daily session), so it was usually about two hours long, with half an hour for each class. Don’t worry, though! The teachers made up for lost time in assigning plenty of homework! Who was the coolest person you met? Did you have any interesting interactions with any Senators? Though the page program was by far the most academically, physically, and mentally challenging thing I’ve ever done, I wouldn’t trade the experience for the world. I learned so much and made friends that will last a lifetime! That said - I am very happy to be back! Photo: Junior Brennan Leach served as a Senate page this past semester. During her time as a page, she witnessed a federal government shutdown, the passage of the GOP Tax Bill, and met many of her political heroes.